LONG READ: Dublin’s Liffey Cycle Route has the potential to be a backbone of a segregated cycle network in the city and a catalyst for cycling attractive to almost everyone — so we are making the below suggestions for the route. ⇒ This is part 2. While the introduction on all parts of this mini-series are identical, you may want to read part 1 first. If you read any other part, skip to the images below. There is currently no official preferred route for the project. The preferred public route — option 3 — would need some changing because of an apartment block in the way of the bus route for that option, and other options can be looked at in light of separately planned city centre traffic restrictions. IrishCycle.com has in the last year strongly advocated for support for option 3, so we are using that option as the bases our our suggestion. However, most of our suggested improvements will apply to most possible routes. If this is viewed as criticism, it should be viewed as constructive criticism which builds on the good work of designing the route so-far and fitting it on to the north quays route. We’re really advocating for Option 3 Plus: Plus more greenery, plus better connectivity for cycling and walking, and plus better bus priority measures to make sure diverting buses off a section of the quays won’t notably slow buses down. ‘Plus’ means redefining the design and adding to it to maximising the potential of many aspects of the route. This article starts about midway on the Section A – Option 3 Bus Croppy Acre drawings, from the junction with Rory O’More Bridge / Ellis Street to the Four Courts — further posts will look at the detailed design of the other sections. 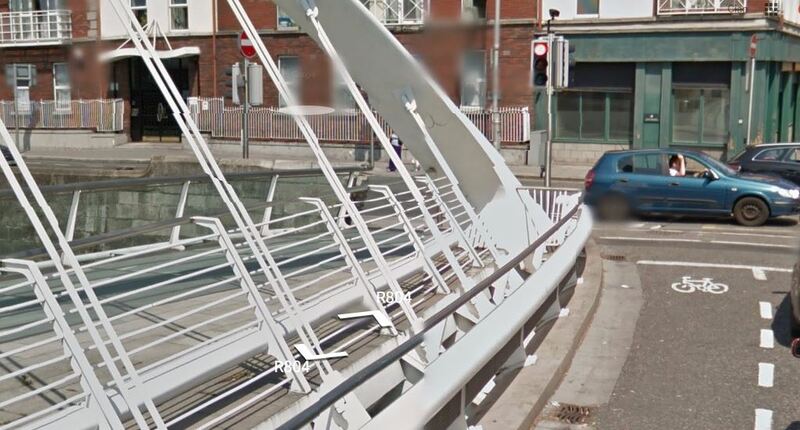 This is the junction with Rory O’More Bridge and Ellis Street (see Street View). First off: We’re unsure how well these junctions will work and a lot will depend on traffic light sequencing. At this junction, the bridge crosses the river to Watling St (an area of high-density housing) and onto James’s Street / Thomas Street. The area directly around James’s Street / Thomas Street has it all — employment (the Digital Hub, James Hospital etc), shopping (ie Lidl, the markets etc), residential (the Liberties etc), and tourist attractions (ie the Guinness Storehouse, which is the tourist attraction which gets the most visitors in the country). In 2010, there had been plans for a contra-flow cycle path on Watling St — which was one of around 11 sections of contra-flow cycling routes planned around the city centre which was made public in 2010 but then the plan never went anywhere. Implementing the contra-flow route now is key to safe two-way cycling access to/from the Liffey and the Thomas St area. Any suggestion will require dedicated cycling paths or lanes on the bridge and while this will reduce car capacity, the amount of permeability gained will be radically positive. Watling St, pictured to the left of the above image, is quite wide for a minor, one-way street and should be able to include a contra-flow cycle path, a traffic lane and possibly also a with-flow cycle lane. It’s a candidate for a two-way path, with almost no frontage on the west side of the street, along which is mostly a boundary wall of the Guinness site. This is a highly residential area — according to 2011 CSO Census data some of the sites here have population densities of between 10,000 and 20,000 residents per square KM (although the area is not that dense overall) . Even with the tall walls of Guinness lining one side of the street and the Digital Depot (which houses tech companies) at the top of the other side of the street, it’s still contains more residents per square km than most urban areas of Ireland. Watling St is not just used as a rat run, but is nearly defined as a rat run. Putting a contra-flow cycle path and with-flow cycle lane — or more so a two-way cycle path — would reduce speeds on this relatively heavily trafficked route and reduce the focus of it as just a motoring rat-run route. We feel the need to stress the idea that this is a highly residential area because the idea of the city centre being residental is often lost on people who have never live there. 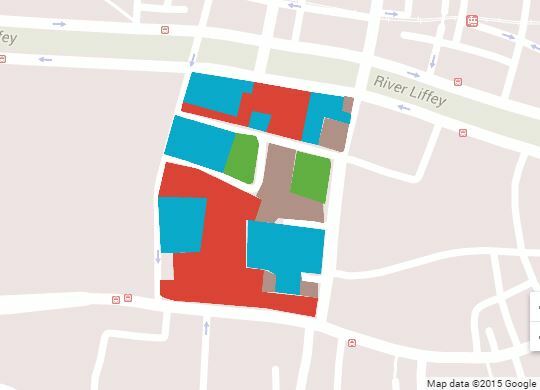 The block of land surrounded by the quays to the north, Thomas Street to the south, Watling St to the west and Bridge is mostly occupied by non-residential. The bulk of the land is the Digital Hub and other retail / commercial units (red), a number of brownfield sites and rundown buildings (brown), and green or public areas (green), yet the rest of the block (blue) still contains over 1,140 residents. There’s a mix of 3/4/5 storey residential, but nothing much above that. The Census data shows that 64% of households in the Electoral Division of Ushers B have no car access. Of the remainder most had only one car (32.6%). Those who had more than one car per household account for only 3.4% of the population. For the rest of the quays, it’s worth noting that even at 64% of households with no car access in this Electoral Division, this is relatively high compared to along most of the quays. (The Docklands. More so, the south Docklands being the main exception). Back on the main line of the Liffey Cycle Route and the route is at the point of Blackhall Place and the James Joyce Bridge. If buses which use Blackhall Place are to be diverted into Smithfield, then the bus lane shown here should be turned into a cycle path. Possibly even using the space to provide segregated cycle paths on both sides of Blackhall Place between the quays and the Luas tracks. The pedestrian crossing on the bridge is shown set back to allow for people turning from the cycle route into Blackhall Place. But — as shown by Google Street View above — it’s unclear if the pedestrian crossing can be set back. An alternative which would work with the above suggested segregated cycle paths on both sides of Blackhall Place is a simultaneous green sequence for bicycles. At Hendrick Street the east-west cycle path traffic is directed to yield to people crossing over the quays (This is the design included at the area marked green in the above image). A main route or main cycle path yielding to bicycles coming on and off a side road goes against the grain. The cross section shows how this is the narrowest section of the route — only with buses diverted, there’s just about room for all remaining modes to be accommodated. Talking about buses, the above image shows how buses are accommodated along the Luas tram tracks around Smithfield. That was the plan anyway. However, the cyan coloured shape is the location of an under-construction apartment block which also stretches out into the bus lane area which is shown. The apartment block is now well advanced in its construction and there is now no scope in providing for the bus route as shown above, changes will be made. It has been suggested that buses and trams could share for a short distance, but it’s unclear if this can be made work. This is a close-up of the last image. In this plan there’s a bus stop beside the Smithfield Luas stop. It looks like the stop could fit 3 buses at a time while allowing buses which are not stopping to continue without stopping. As shown the bus stop will be an improvement to all current bus stops on the quays, but extending the bus stop bay further to allow extra space for buses to stop could help address the fears from some that this route would delay buses for a long time. All junctions the bus route crosses should also include yellow boxes to highlight that they should not be blocked. The roll out of red light traffic cameras along Luas tram crossing points should also cover the bus crossing points and this should be highlighted with signs and on-going media campaigns. The quickly drawn red arrows (inserted by us) should be included as a contra-flow cycling route, this is the street which runs up the east end of Smithfield square. At the point south of the Luas line shown in the image, the contra-flow route should be a segregated cycle path, and a few meters north of the tracks it could easily just be a cycle lane or just a route signed as two-way for cycling. In reality, this would just be regularising every-day practice on the street. The flow of traffic reverses at different points, as happens in the Netherlands, this street should be two-way for cycling throughout. The square has two DublinBikes stations — a good place to start pushing more contra-flow and more so with the need to have links to the Liffey Cycle Route. This contra-flow route should be done before the Liffey route opens — these links should be in place from day one so people cycling have proper links to the quays route. The above image shows how the bus route reaches Church Street, before rejoining the quays (see below image). This is a key junction for buses and, if there’s scope for more red light traffic cameras in Dublin, this junction should get priority. The above image shows before (right) and after (left) layouts of the Church Street. 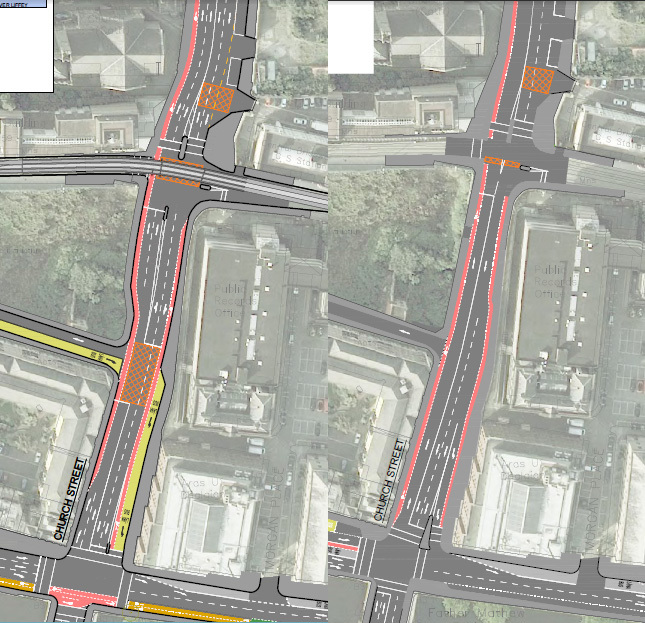 The changes includes footpath narrowing (significantly so outside of St Michan’s Church), and provision of new traffic lanes (and no provision of continuous cycle lanes on both sides of the street). It’s unclear why any of the car-centric changes north of the Luas tracks are included in the Liffey Cycle Route consultation. The widening is mainly from the (OPW-owned?) undeveloped site between Hammond Ln and the Luas tracks, and it is also from the footpath north of the Luas line up to St Michan’s Church. Without cross-sections it is hard to confirm but there also seem to be some footpath narrowing beside the Four Courts where the roadway is widened. The current cycle lanes are largely narrow to very narrow — again, it’s hard to confirm if there’s improvements without cross-sections, but it does not look like the cycle lanes are anyway improved. This is the junction of Church Street and the quays. The above section, marked on the last map as H8, is a little west of the junction and one of the narrowest sections of the route. And if you look at the last map drawing, you’ll see that the cross section isn’t even taken from the narrowest pinch point. It’s often hard to gauge the widths, at the H8 marker the cycle path is 3.5 metres and the traffic lane is 3 metres. While it does seem like there’s a lot of car-centric space with turning lanes in all directions, the building side lane will likely be used for loading as well as turning. And, even if the traffic light sequencing segregates the cycle path movements from the right turning cars, it might still be safer that such drivers have their own turning lane. Tree planting on the extended footpath area could be a good idea to soften the look of the area and add a bit of nature. Some tree planting could also possibly be provided between the cycle path and the turning lanes. 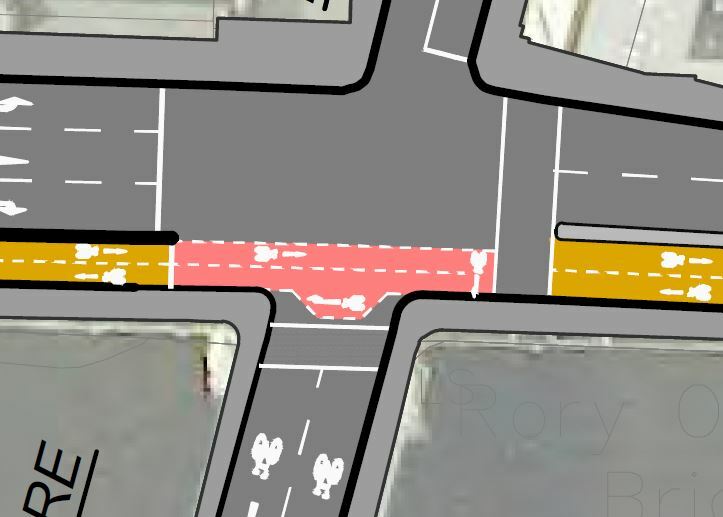 In the above image we suggest future proofing for the cycle path by including a right hand turning lane to allow people cycling to turn northbound onto Church Street.